Some of the best moments in life are captured in photos. From births to weddings, holidays and other important events, all of them can be retained in photos virtually forever. But what happens if you accidentally delete some of these precious memories with huge sentimental value? Digicam Photo Recovery is an amazing tool that can get them back for you. Using this application is extremely simple. Select the drive where the accidentally deleted images were stored and click on the “Find my Pictures” button. 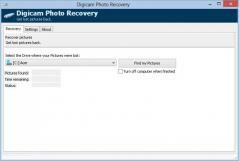 Digicam Photo Recovery will automatically retrieve all the deleted images on the drive.